PennsylvAsia: "A Taste of Taiwan" cooking demo, May 24. 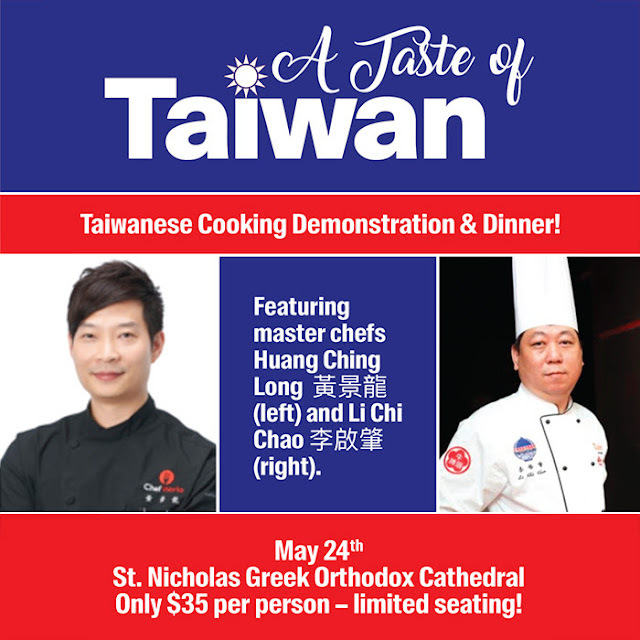 The Pittsburgh chapter of the Organization of Chinese Americans will present another "A Taste of Taiwan" cooking demonstration on May 24. Watch award-winning master chefs Huang Ching Long and Li Chi Chao as they showcase the ancient techniques of Taiwanese cooking. Learn and WATCH the chefs focus on light, natural flavors and simple preparations including innovative ways to meet the demands of healthy vegetarian cooking. Then sit down to enjoy this special cuisine with your old friends and maybe meet some new ones! Tickets are $35 a person and are available online. The event will be held at the Saint Nicholas Greek Orthodox Cathedral in Oakland (map).